I have captured this 'Pearl - Spotted Owlet' couple at night at Kruger National Park during our staying at Pretorioukop Rest Camp. My wife helped me focusing torch light on them and obviously I used flash. Pearl - Spotted Owlet is a small Owl that breeds in Sun-saharaan Africa. It has longish tail and yellow eyes. The upper parts are rich brown, heavily spotted with white. The flight is deeply undulating. This is a great capture, perfectly exposed. The moon is a nice bonus. 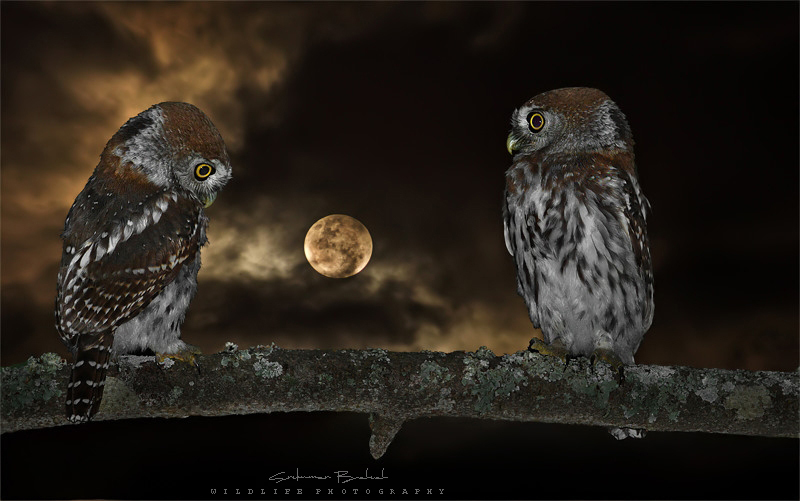 Lovely composition with the two Pearl-Spotted Owlet face to face. Despite the light conditions the details and colors are excellent. Outstanding capture. This need passion. Looking like a painting. Great job Srikumar. The presence of the moon is an asset to the composition. The point of view is showing the details of the Pearl-Spotted Owlets. The sharpness is very good. Have a nice day.